Often cited as one of the most beloved movies of all time, The Wizard of Oz still manages to be an irresistible adventure. Having not watched it since I was a kid, I reluctantly watched it recently assuming that it wouldn’t hold up or would be too childlike. I thought it might have even lost its magic since it has been parodied so many times. But even after over 70 years, Oz maintains its appeal. What I found so mesmerizing first and foremost was the art design. The sets, costumes and props are all magnificent. Sure you can tell that parts of the scenery are fake, or that sometimes the Tin-man’s costume doesn’t even look much stronger than felt, but these small details are negligible compared to the extravagance of the costume designs and expansive set pieces. There is also of course, the great sequence when Dorothy opens the door of her crashed house, and the audience is transported from a sepia-toned Kansas, into the magical technicoloured world of Oz; which as it turns out was MGM’s response to seeing Disney’s Snow White in colour 2 years earlier. Everyone of course loves and remembers the songs like ‘Somewhere over the Rainbow’ and ‘Follow the Yellow Brick Road’, but in watching it recently, there were numerous songs in there that were just not good and clearly forgettable. Some of them really got on my nerves, but they rarely last more than 30 seconds anyways. The whole film clips along at a nice pace so that if there is a scene you don’t enjoy, it’ll be over soon and you will forget it ever happened. 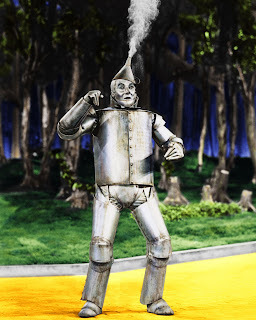 It is a wonder this film ever got made with all of the accidents (Toto getting stepped on and injured; the original Tin-man getting poisoned from the silver make-up) and with such an insane plot involving crushing witches with houses, befriending a lobotomized scarecrow, a robot and a cowardly lion with a NY accent. But what holds it all together is the universal emotions a child has growing up and not having enough smarts, love and bravery to make it in the big scary world. Summary: Definitely dazzling to watch and to be in awe of the sets and sweeping camera work. After so many years, (most) everything about the film has become so memorable and therefore purely entertaining. Watch it as a kid to have fun, but watch it again now to have fun and feel like a kid. This has ranked #251 of all the 1502 movies I’ve seen [on flickchart.com].